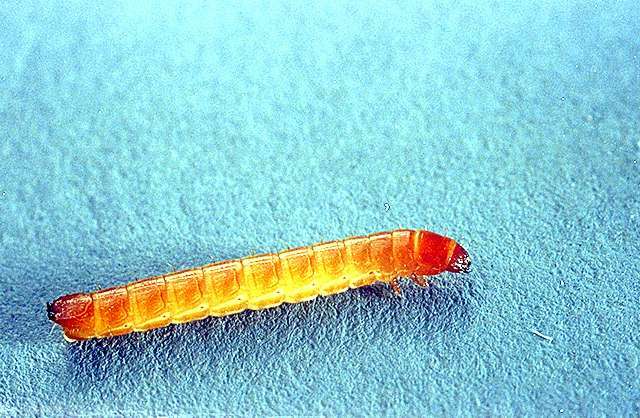 Pest description and crop damage Smooth, hard-bodied, cylindrical, shiny tan "worms" about 1 inch long when mature. They have 3 pairs of small, thin legs behind the head; last abdominal segment with characteristic "keyhole" notch. Damage from larval feeding appears as seed destruction during germination. On older plants, wireworms scar and channel the taproot surface as well as chew winding tunnels into the taproot. 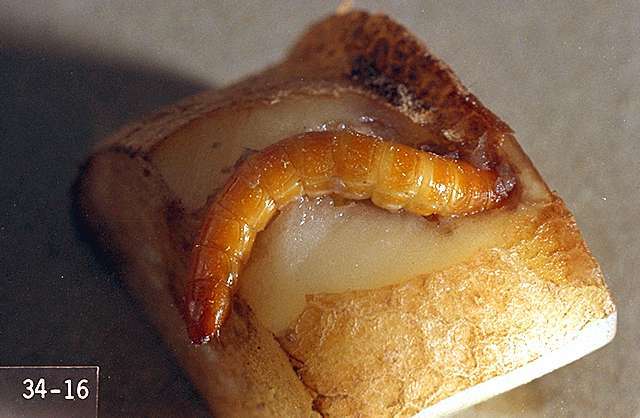 Sugar beets following grassy pastures are at highest risk for wireworm infestations, because, like white grubs, wireworms prefer grasses for egg laying and larval feeding, and wireworm larvae require 2 to 4 years for egg-to-adult development. Corn or cereals in rotation with sugar beets also increase the probability of wireworm infestations, especially if reduced tillage in rotational crops leaves high amounts of organic matter and crop residues in the soil. Scouting and thresholds No formal economic thresholds exist for wireworm insecticide treatment decisions. 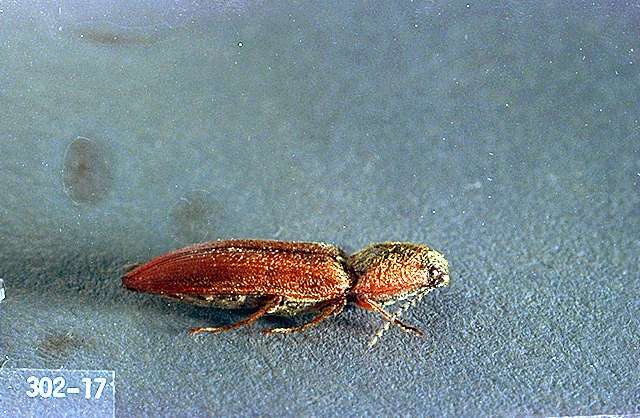 In problem fields, use wireworm seed treatments for cereal crops grown in rotation with sugar beets. 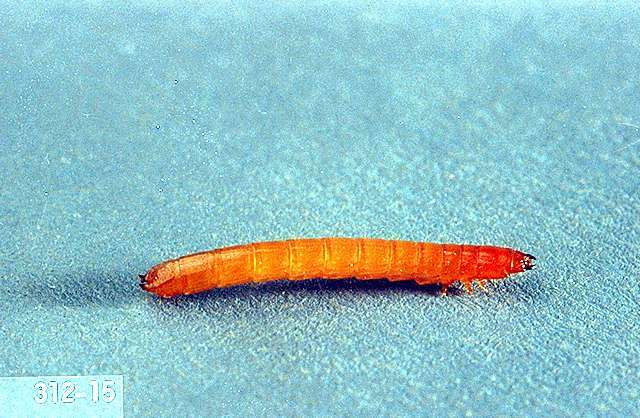 There are no effective "rescue" treatments that can be applied postemergence in sugar beets for wireworms. Use field history and wireworm baiting stations to determine need for at-planting insecticide treatment against wireworms. 1,3-dichloropropene (Telone II) and 1,3-dichloropropene/chloropicrin (Telone C-17, Telone C-35)-Preplant soil fumigants. chlorpyrifos (Lorsban 15G, Lorsban 15G Smartbox, Pilot 15G, Saurus ) at 1.5 to 2 lb ai/a at planting. Suppression only. REI 24 hr. Do not apply granules in direct contact with seeds. Do not apply more than once per year. Apply in 4- to 5-inch band and incorporate into the top 0.5 to 1 inch of soil. clothianidin (NipsIt INSIDE, NipsIt SUITE)-Application only by commercial seed treaters; no on-farm seed-treatment application. clothianidin/Bacillus firmus I-1582 (Poncho/Votivo) Application only by commercial seed treaters; no on-farm seed-treatment. clothianidin/beta-cyfluthrin (Poncho Beta)-Application only by commercial seed treaters; no on-farm seed-treatment application. terbufos (Counter CR Lock'n Load, Counter 20G Lock'n Load, Counter 15G Lock'n Load, and others) at 0.6 to 1.2 oz ai/1,000 row ft banded at planting. Apply in 5- to 7-inch band over the row and lightly incorporate to 1 inch. One application per year. Do not place granules in direct contact with seed. Do not exceed 2 lb ai/a. PHI 110 days -or- Apply at 0.6 to 1.2 oz ai/1,000 row ft, modified in-furrow, at planting. Apply in furrow, 2 to 3 inches behind seed drop zone, after some soil has covered the seed. One application per year. Do not place granules in direct contact with seed. Do not exceed 2 lb ai/a. (Mustang) at planting, 0.05 lb ai/a. Apply in furrow or in a T-Band (band over open furrow) in at least 3 to 5 gal/a water. PHI 50 days. Do not apply more than 0.15 lb ai/a per season (at planting/foliar applications). (Mustang Maxx) at planting, 0.025 lb ai/a. Apply in-furrow or make a 3 to 4 inch T-Band at planting in a minimum of 3 to 5 gal per acre. 50 day PHI for tops or roots. Do not apply more than 0.075 lb ai/a per season. REI 12 hr.